Disney is improving access to its theme parks for guests with visual disabilities with a GPS-based handheld device that provides detailed audio descriptions of outdoor areas at Walt Disney World and Disneyland resorts. Audio descriptions have been available on these wireless devices since 2009 for around 50 rides and attractions, including Magic Kingdom’s Haunted Mansion and Pirates of the Caribbean. The new and improved device, however, new helps visually impaired guests understand their surroundings as they walk Disney parks. In addition to describing the park’s architectural elements, the device can say aloud other visual cues such as the location of the nearest restroom and restaurant. WGBH Boston’s Media Access Group teamed up with Disney to deliver the outdoor audio description, marking the latest collaboration between the two organizations, which began with the installation of WGBH’s Rear Window Captioning system in Disney’s theater-based attractions in 1996. Disney has patented and licensed the assistive technology to companies like Houston-based Softeq Development Corp, which that makes assistive gadgets for people with disabilities in places such as the World of Coca Cola Museum, The Hall at Patriot Place and the Dallas Cowboys Stadium. Rides at Disney are also accessible to people with physical disabilities. For instance, Disney World offers vehicles at Toy Story Midway Mania! that enable guests to remain in their wheelchair during the ride. Deaf and hard of hearing guests can also read captions on the device these rides, and Disney offers American Sign Language interpretation at live shows. Disney’s Handheld Assistive Technology Device is free for guests with a $25 refundable deposit. 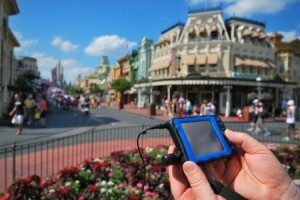 Audio descriptions will be available at Walt Disney World Resort starting June 27, and at Disneyland Resort next year.